The Breaking the Silence Project encourages families of addicts to seek help for themselves through group support systems, parent addiction coaching, online social media groups, and through monthly free phone telephone meetings. 3rd Thursday of each month at 6:30pm –Eastern Time. To register, Contact Diane:dbuxton77@hotmail.com. 4th Monday of each month at 7pm —Eastern Time. To register, Contact Karen:karenjbutcher53@gmail.com. Pal Phone Meetings: at 6:30pm Eastern Time, (5:30 Central Time, 4:30 Mountain Time, and 3:30 Pacific Time). For those that will be calling: 1-641-715-3856, access code 141538 press the # key. If you are not able to call in at your time zone time, please call in when able, we would love to have you! (Diane Buxton). Parents of Addicted Loved-ones (Pal Groups) is a support group of parents helping parents. PAL was founded by Mike Speakman, L.I.S.A.C., and Director of Speakman Coaching and Consulting. Groups meet every week to offer education and support, at no charge, for parents who are trying to save a son or daughter from addiction. PAL can also help spouses who feel they have to parent their addicted partner, who is acting like a child. PAL is especially helpful for parents and spouses, however all other sober family members and friends are welcome at our meetings. For Those who have no PAL Weekly Group Meeting in their city or have challenges attending a group in person you can join in a teleconference once a month. Parent Coach Mike Speakman facilitates the monthly parent telephone sessions. The free Pals telephone meetings are held the 3rd Thursday of each month. Pals offers a free 90 minute conference call. All you need is a telephone. The meeting is run the same way as a Pals Group in-person meeting and there’s no charge. If you’re interested, email Diane, at: dbuxton77@hotmail.com and request information for the topic of the month. Also, if there are no Pal Group meetings in your city a possible consideration is starting one in your town. Celebrate Recovery Group was founded about twenty years ago by Saddleback Church in California. Senior Pastor Rick Warren wanted to offer a recovery program based upon the Bible, and from his Scriptural research, Celebrate Recovery was born. The support groups are for anyone, not just addicts, but for people with various hurts and hang­ups. The program uses Eight Principles and Twelve Steps, all built on the foundation of the Bible. Celebrate Recovery can now be found in churches across the United States. Probably the most familiar advice you will receive from others is to join an Al­anon or Nar-anon group and attend meetings on a frequent basis. Al­anon family groups hold meetings every day of the week. Members share their own experience of living with alcoholism. The group follows what is called the Twelve Steps. Al­anon does not offer advice or counseling, but members give each other understanding, strength, and hope. Nar-anon is similar, but the family groups share their experience living with narcotic addiction of a loved one. Families Anonymous is a 12 Step fellowship for the families and friends who have known a feeling of desperation concerning the destructive behavior of someone very near to them, whether caused by drugs, alcohol, or related behavioral problems. When you come into a Families Anonymous meeting you are no longer alone, but among friends who have experienced similar problems. Any concerned person is encouraged to attend our meetings, even if there is only a suspicion of a problem. Learn to Cope: A peer led support network for families dealing with addiction and recovery. Learn to Cope is support organization that offers education, resources, peer support and hope for parents and family members coping with a loved one addicted to opioids or other drugs. Learn to Cope members are people who loved their children deeply, yet still found their families damaged by addiction. Learn to Cope has chapters throughout Massachusetts that meet weekly and are constantly working on prevention and awareness efforts throughout their communities. Meetings feature guest speakers including professionals in the field of addiction who educate us as well as people who have been successful in long-term recovery who offer us hope. Learn to Cope also has a free private online family discussion board forum where members can get confidential support 24/7. This website and forum were formed to support families and educate them on addiction and resources, as well as a place to go when feeling desperate or alone. With over 5,200 members and growing every day, this forum allows a safe places for people who have been there to communicate with one another. Our mission is to support with kindness, care, compassion and empathy. You are not alone in this and where there is life, there is hope. The Addict’s Mom was founded by a mother of an addict offering an online support group for moms of addicts. It is a safe place where mothers can “share without shame” (plus many other support perks). The site has grown to over 5000 moms and close to 12,000 on The Addict’s Mom Facebook. It’s tragic to think of that many families who have been affected by addiction, but the site provides a reprieve for those who are in much need of support and encouragement. This courageous mother, Barbara Theodosiou, began reaching out to mothers out of her own need, and now, state chapter groups have been formed and are popping up and gaining momentum across the nation. The Addict’s Mom holds the goal of allowing parents of an addict to “join with others from your state, seek support, share your story, make new contacts, gain awareness, and reach out to others who have a loved one suffering from substance abuse.” As of today, the city chapter parents corroborate for support and encouragement, raise awareness, and advocate for addiction reform on behalf of their loved ones. This is by far the best support I believe to be on the web for parents of addicts. 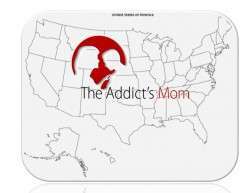 Check out your state chapter of The Addicts Mom for information on what is happening in your state (If you are not a member, the site will prompt you to join). The chapters for each state can be found on the main home page.